I started Starbrush Facepainting Melbourne in 2014 as a labor of love. Now Starbrush Facepainting Melbourne has grown throughout Melbourne. From a small hobby (painting at local community events) to providing facepainting services for birthday parties, events, corporate functions and markets. 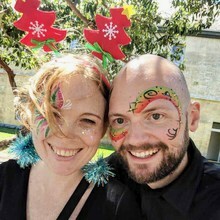 Starbrush Facepainting Melbourne is a fun and fast mobile face and body painting service for all occasions, from large promotional events to smaller scale celebrations such as birthdays and hen's nights, for ages 1-100. Looking for a local, fun and reliable Facepainter for your next birhday party or event? Contact me today or follow Starbrush Facepainting Melbourne on Facebook and Instagram.